Perhaps, the strongest and most beautiful creation of God that a woman is, she deserves to be loved, respected and looked up to in every aspect. As a way to salute her for what she is, International Women’s Day is commemorated every year all across the world on March 8th. The day is celebrated in different ways at different parts of the world. The day celebrates admiration, love, respect, achievement, appreciation towards woman-the creature with profound love and the unparalleled power to give. Today, woman has carved a niche for herself in almost all the arenas. From Barkha Dutt in Jounalism, Asha Bhosale in Music, Kiran Bedi in Indian Police to Aishwarya Rai in films, Sudha Murthy in Social Work, Veena Patil in Travel and Tourism and numerous other names and numerous other areas, she has proved that with her determination and will power, she can excel in whatever she gets on to. 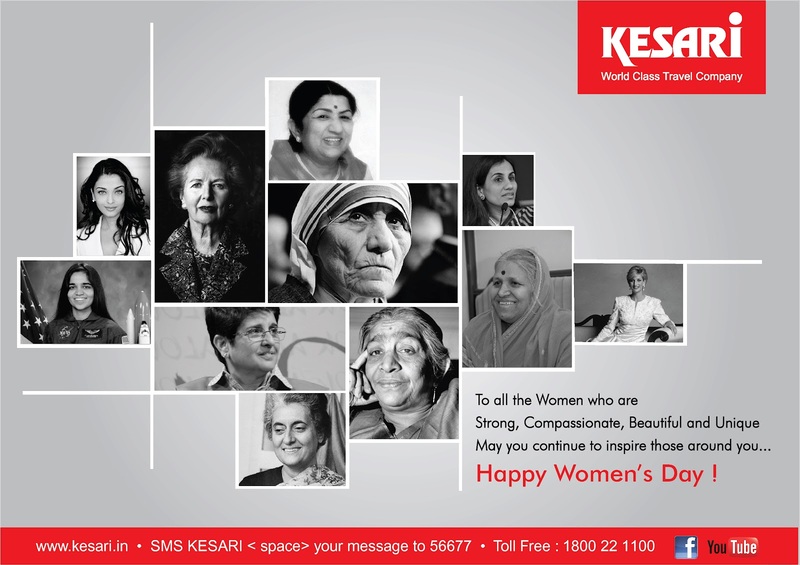 Women’s Day is truly the day to celebrate womanhood. Women should rejoice their being, step out and have a ball of a time. Men of course should show their love and respect to them in the best possible manner. To their mothers, sisters, wives or friends, they truly need to showcase their love and respect for her. We all know, she does deserve to be acknowledged not just on a particular day but every single day. 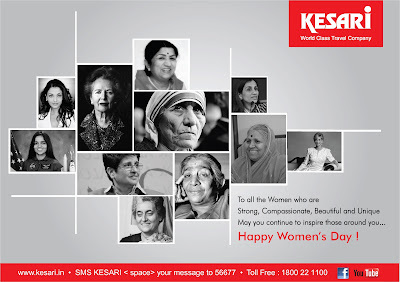 Kesari Tours wishes all the women a very Happy Women’s Day. Kesari is running a Facebook Contest..!! Come, participate and join..! !